At times dominated by constant exposure to social and personal information, FOMO (Fear of Missing Out) conditions our need to ‘attend’ virtually, as a statement, even more than to ‘be’ in the physical domain. 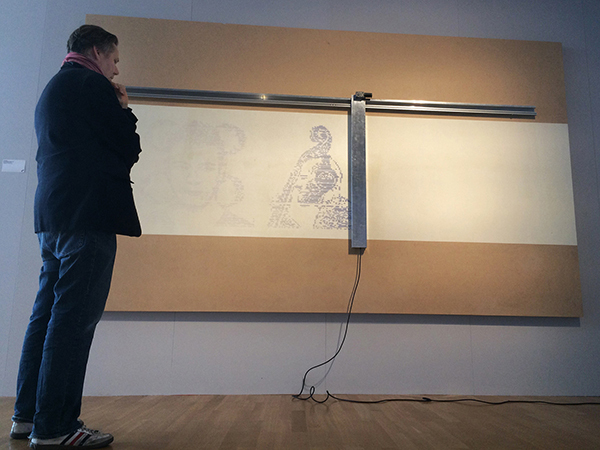 Attending Machine temporarily visualizes a feed of portraits taken from Facebook accounts. The participants have agreed to take part in a virtual Facebook event named ‘Donate your virtual identity to art’, only to be actualized within the machine. The machine writes on a wall painted with an ultra-violate sensitive pigment. While passing over the surface, it turns on and off 96 UV LEDs in a carefully timed sequence, exposing the surface to UV and temporarily creating dots and dashes on the surface. Those are added, creating the ephemeral images. The work questions the possibility of personal connection and intimacy on today’s digitally connected world. The Facebook platform is used as a case study from which data is collected. The attendees’ profile images are printed and fade as time passes. The portrait is no longer eternal and is based on the way the person depicted chose to represent him or herself in the social network. One by one, the images appear and fade away. The act of printing makes each individual identity present for a moment within the masses. The ephemerality of the images poses questions: What is the point in an identity representation in the digital age and why do we so desperately want to be seen and ‘liked’ within the feed? Are we just another statistic in the virtual space? The Attending Machine aims to slow down our accelerating life stream, and to enable a technological poetic reflection on the state of being.